With my time in Central America now at an end, I thought, like my list of things Ilearnt in Mexico, I might put together a collection of things that stood out while travelling through this part of the world. Central America is a great place for doing almost anything you want to do. From adventure sports to surfing to hiking, or just relaxing or having one (or 6) too many beers on a pool party crawl (really, its a thing). There are very few things you cant do while you're there. Some of this has to do with very little being regulated, so its just a matter of finding a way to do it. Before leaving Australia I went to a travel medical clinic to get all the vaccinations and inoculations you need before hitting the road. If you're anything like me this is something – along with travel insurance – that you wish you could skip, and you'll give it some serious thought before eventually getting every shot they recommend of you. I'm certainly glad I did. After being attacked by a pack of dogs in a small town in Guatemala, I was very thankful for the fact that due to my pre exposure vaccines for rabies, I had some time to sort out the last few shots of the course. If not for the vaccines I would have required the urgent, expensive, painful and hard to find urgent shot and could have totally ruined my holiday. While I've been travelling heavily for 10 years now, much of that travel has been through the first world and I'll admit that has formed some complacency when crossing borders. An error by a border official when I entered Guatemala meant that I didn't receive the necessary entry stamp, which led to me not being allowed to leave the country when I tried several weeks later. After paying a couple of fines for being "illegally" and wasting a couple of days Guatemala City, I was finally able to leave. Since that point I have learnt my lesson. Every border crossing - check your stamps! A further lesson came when trying to leave Costa Rica, where a $7 exit fee should have been paid when buying the bus ticket from the capital and the only option for paying it at the border being open for a mere seven hours a day. 15 hours at the border later and I'll make sure I do more research before crossing any more borders. The modes of travel throughout Central America vary from overly packed taxis, to chicken buses and small boats (launchas) that feel like they could sink at any moment. Even shuttles, popular through Guatemala and aimed directly at tourists, would be considered the least comfortable form of transport where most of us are from. Chicken buses are one of the most authentic experiences of travelling through Central America. The former US school buses – some of which have been pimped out with big screen TVs, and crazy colour patterns – go from town to town as well as picking up people and random points along the road. The first chicken bus I got on was missing a seat as well as the part of the floor that was supposed to be under that seat. While they can be uncomfortable, chicken buses – named because of that fact they cram so many people into them – are cheap and relatively efficient and you get to see how the locals travel, as well as how they transport everything from fresh produce to electrical goods. I've made no secret of the fact that I loved the food in Mexico. My current body shape stands testament to that fact. Central American food doesn't quite measure up. That's not to say it is bad, it has just suffered by comparison. While beans and rice can be good, beans and rice making up a large portion of every meal gets a bit old. It seems every city and town in Central America has a "famous" volcano and a bar or drink called "lava". While it may seem as though it becomes repetitive, many of the volcanoes offer different things to see and do. Most of them offer good hiking and views, while many also offer the chance to camp out on top. 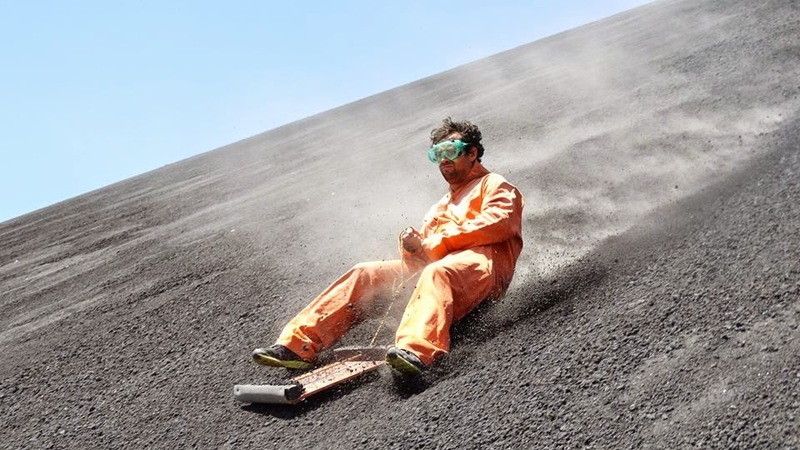 One volcano in particular, affords you the chance to go "volcano boarding" and it is every bit as fun as it sounds. Sure, you get the "you're never too old" to learn something new types. However when an Australian - whom everybody in the world expects to know how to surf - is taking his surf lessons with a couple of Canadians, a girls from cold parts of Europe, you start thinking you might have missed the boat. Particularly if a tiny girl from Denmark is instantly better than you. Sure I had fun trying for a few days, but I think I'll stick to volcano boarding. While you hear a lot about certain landmarks and attractions in Mexico or South America, you don't tend to hear a lot about the beauty that Central America has. Starting in Tikal, Guatemala one of the most stunning of the Mayan ruins, all the way down to the San Blas Islands in Panama, the region is bursting with amazing things to see. One of the most amazing is one that I'd never heard of - Semuc Champey in Guatemala. I first heard of the place - a series of beautiful clear pools in a natural limestone bridge which lies over the top of a river - from people coming in the other direction while I was in Mexico and so glad I did. There is a very established "gringo trail" in Central America. I'm sure there are people who will find a way to stay off the beaten path, but in reality they're beaten for a reason. Most of the places on the gringo trail are genuinely worth visiting. Running into people you have met in a past town can be problematic, sure, but most of the time it turns out to be a lot of fun, and that person you hung out with once for a day or two turns into someone you travel with for a week purely by chance. Anyone who has been keeping up with this blog knows I have a difficult time moving on from any place I love, and Central America proved that. What I thought might take me 4-6 weeks took me around twice that. While this has left me with far less time to cover South America on my way to the cup, I wouldn't change any of it (OK, the dog bites and dodgy border crossings I would) as I had such a great time everywhere I went, and it's not like I cant ever come back.